The ancient temple of Subrahmanya Swāmi is situated about a mile from the railway station, half of which distance is covered by the Panchayat Board Road, and three more furlongs by a temporarily covered highway paved long ago with granite blocks by a sannyasin. This portion of the road is much rickety owing to subsidence of the stones, and, the pedestrian has to pick his way carefully with a humble heart and bowed head not to hurt himself. The road is decidedly tabooed for wheeled traffic, and consequently the left marginal portion of which is used. Both the sides of the highway are lined with shops, coffee-houses, and chatrams owned by the several communities. 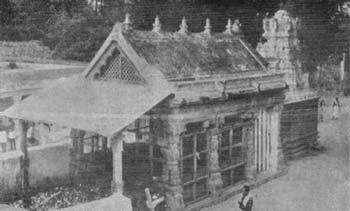 Two covered stone mantapas, one of 48 pillars of the Mudaliars and of sixteen of the Reddiars, afford a covering on the way (see illustration) till the Agastyar Temple, and next the Thūndukai-Vināyakar shrine is reached. The worshipper now pays obeisance to the Thūndukai Vināyaka and offers his vow of a number of cocoanuts breaking them in the frontal enclosure intended for it. The road from here is sandy to the main temple environs. The mantapas to the right and left of the Vinayakar shrine are those of Pillaiyans and Karkattars and of the Tiruvavaduthurai Mutt. The historical associations of the Vadamalaivappa Pillaiyan's Mantapa are interesting. The sandy path from now is covered overhead by a permanent covered way, standing on cement-concrete pillars. This is a benefaction of the sannyāsin Vallināyaka Swāmi. It extends to the Shanmukha Vilāsam to the east, and branches off near the Devasthānam office towards the giri-prakāra to the North and the East coming around the main temple, the Mela gopuram and along the sea-border, a distance of about two furlongs and, terminating but by a short distance to the Shanmukha Vilāsa. 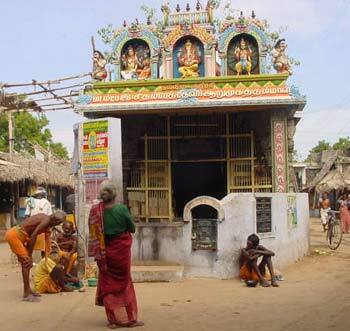 It is on this route lie the Vasanta Mantapa, and the approach to the Mela-gopuram entrance and the Kalyāna Mantapa. The Vasanta Mantapa is a recent noble edifice standing on 120 columns and with a central porch. It is here the deities are brought in Māci and āvani festivities, and, where they receive their ārātanas before they are taken out in procession. The occasional religious discourses and musical performances are also held here. During the Vasanta festival of ten days the stone trough around the central porch is filled with cool waters and the mantapa gaily decorated with evergreens and plantain trees. On the Giri-Prakāra removed at a distance from the Vasanta Mantapa stands the ānanda Vilās Mantapam on a raised sandy promontory majestically over-looking the Gulf of Mannar. It is a mantapa of sixteen pillars and worked in black granite, 28¾ feet long, 24½ feet broad.  Shanmukha is taken here in all majestic pomp on the eighth day of the Māci and the āvani festivals, and the enthusiasm of the crowds of worshippers on those occasions knows no bounds. The deity is here given an ablution in drums of rosewater, and soon after the procession starts again. The Lord halts at the Shanmukha Vilāsa on the path as He returns to His sanctum within the temple. On the eastern Giri-prakāra, another small stone mantapa 9-1/2 feet square and standing on four pillars on a spot overlooking the Vathanarambha Tîrtha on the eastern sea border has to be mentioned. 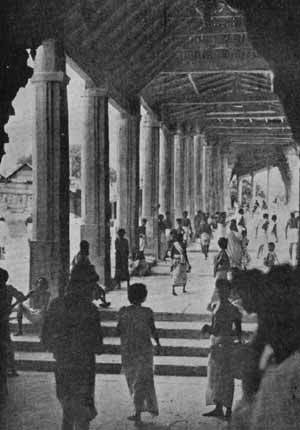 Here the communities who till recently could not enter into the portals of the temple gave their offerings of fruits and coconuts and had a darsan of the Lord through an aperture 9" by 4-1/2" in the temple compound wall of 4' 9" thickness. The sacred precincts of the temple have since been thrown open to the Hindu Harijans, and all the other Hindu communities on the 14th of November of the year of grace 1946, for entry and worship therein like all others of the Hindu fold.